The outdoor entertainment is your quality time in the outdoors. Art flourishes where there is adventure; this is where three ingredients merge giving you an experience that you will never forget - music, the great outdoors and of course outdoor cooking. 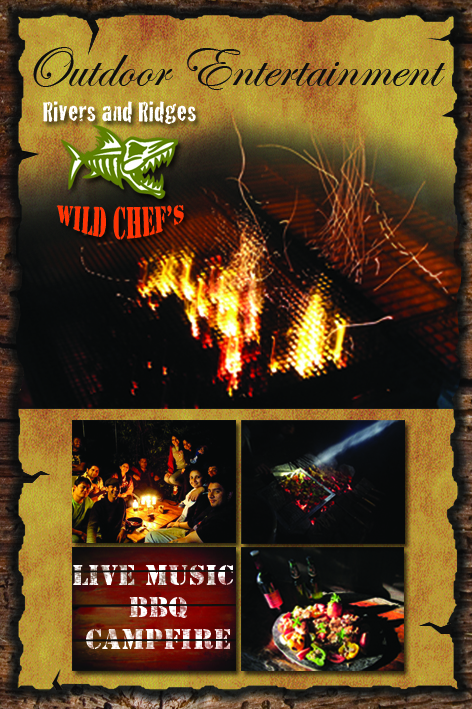 We have our very own food brand ‘Wild Chef’s’ where we do flame kissed BBQ and other variety of open fire and underground cooking to serve your taste buds. We also bring you the best of wild grown edible herbs, fruits and vegetables that are 100% organic. Whether it’s your corporate outing, reunion party or if you just want to have a nature vacation we will make sure of exceeding your expectations for fun and adventure. Enjoy hiking, trekking, fishing, boating, camping and more as you explore the trails and rivers of your chosen location. Take in mountain vistas and lakeside sunsets in the country’s finest forest reserves. All our campsites are located in scenic settings showcasing the natural beauty and geological diversity of India. Music is either played as a recording or live. We are always looking to work with brand new artists and provide them a platform to showcase their talents. This experience is heavenly because instead of a stage back-drop we have it in a natural setting for e.g. there is a massive cave wall or there is a sun setting over the hills or a starry night with light coming only from the bon fire creating different light effects that cannot be compared to any electronically controlled lights. This enchanted event is under our sub brand ‘Raw-Gigs’ Three things combine to give you an experience of a lifetime – excellent food, mesmerizing music and great outdoors. We customize meetings and general gatherings in an outdoor style for several corporate, social groups, family and friends. We take group orders of minimum 15 individuals and maximum 500 individuals with all food, entertainment and stay arranged with at least 3 of prior notice, large groups of over 100 individuals must book at least one week in advance. For booking we take 75% advance and 25% upon arrival. Kids below the age of 8 are not free and above the age of 8 are charged full amount.